Unless you were in attendance at the Double Door for the Windy City Winter Ball earlier this month, it’s very likely that you do not know Rambos. That’s unfortunate. For those of us who were lucky enough to have arrived early for their set, we were treated to a band that has the potential to quickly become a household name among Chicago music fans. At a time where cookie-cutter pop stars are ruling the music charts and making radio almost an obsolete notion for any person with a respectable taste in music, Rambos are a strange, yet revitalizing breath of fresh air. When I say strange, I do mean strange. I then asked Miller to describe Rambos’ sound. “It’s a vocal band,” he began, “everybody has a voice who wants one. Everybody has a microphone.” He paused, as if struggling to find the right words, dissatisfied with the answer so far, finally deciding on, “It’s Rambos.” The band agreed. “It’s Rambos” doesn’t mean anything unless you hear the music, see the live show. Live, Rambos is unlike any band I’ve seen. It’s interesting that, as the band had revealed in the interview, Rambos so easily discarded 2 members over something so seemingly insignificant as a lousy tweek of the band name because, on stage, Rambos seems to be one working organism. To pull any of the limbs off of the single body that is Rambos, would be to kill Rambos. Perhaps the Rainbows proponents were just casualties of the inevitable evolution of Rambos. The sound is indescribable, so I will not try, sufficed to say there are sailor chants, punk covers with Rambos’ lyrics (such as “Do you Wanna Die?” and a lovely rendition of the Black Lips, “Bad Kids, entitled “Faggots”), and many songs about death, blood, ugliness, and monsters. 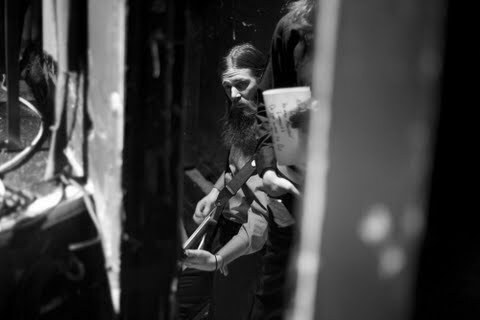 Jeremy David Miller has a stage presence worthy of the band name and the “tough as hell” mission statement that came with it at the cost of 2 band members. 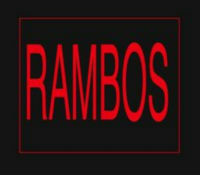 Rambos is full of pleasing gimmicks from the overall coherence of the matching black and red outfits to the theme song lyrics, “We are Rambos.” All that you would expect from a band called Rambos. Here’s a video, courtesy of Grape Juice Records, of “Human Monster,” a highlight of the night for me.